Thaw the necessary kit components, mix and pulse-spin in microfuge to collect solutions to the bottoms of tubes. Keep on ice. Mix thoroughly and pulse-spin in a microfuge. Incubate at 37°C for 2 hours. Reaction time depends on template amount, quality and RNA transcript length. For reactions with transcripts longer than 0.3 kb, 2 hour incubation should give you the maximum yield. For reaction times of 60 minutes or less, a water bath or heating block may be used; for reaction times longer than 60 minutes, we recommend using a dry air incubator or a thermocycler to prevent evaporation of the sample. For reactions with short RNA transcripts (< 0.3 kb), we recommend an incubation time of 4 hours or longer. It is safe to incubate the reaction for 16 hours (overnight). For example, we have achieved good yield with only 0.2 μg plasmid template encoding a 50-mer RNA by incubating the reaction overnight at 37°C. Compared to the standard reaction, this reaction uses 10 μl more water. The volume of NTP Buffer Mix and T7 RNA Polymerase Mix, however, remains the same. The kit contains sufficient materials for 50 reactions. Note that the amount of NTP Buffer Mix in a standard 20 μl reaction can vary from 2 to 10 μl. The final yield is proportional to the amount of input nucleotides, meaning that the nucleotide incorporation efficiency remains the same when different amounts of NTP are used. 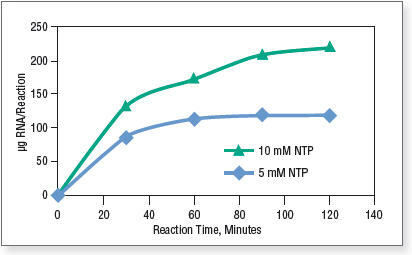 Figure 1 shows the time course of standard RNA synthesis from 1 μg control DNA template coding for a 1.8 kb RNA transcript with the HiScribe T7 Quick Kit using 10 μl and 5 μl NTP Buffer Mix in a 20 μl reaction. Figure 1. RNA synthesis with different amounts of NTP. Reactions were incubated at 37°C in a thermocycler. Transcripts were purified by spin columns and quantified on a NanoDrop™ Spectrophotometer. Optional: DNase treatment to remove DNA template. Standard reactions are capable of generating large amounts of RNA, at concentrations up to 10 mg/ml. As a result, the reaction mixture is quite viscous. It is easier to perform DNase treatment after the reaction mixture is diluted. To remove template DNA, add 30 μl nuclease-free water to each 20 μl reaction, followed by 2 μl of DNase I (RNase-free), mix and incubate for 15 minutes at 37°C.